Please join us for an insightful panel discussion at Carnegie Science Center’s Café Sci! 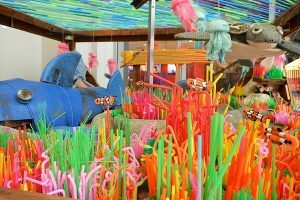 Learn more about the larger issue of plastic pollution and go behind the scenes with the team that created the art installation, Straw Forward. Straw Forward is a collaborative effort of restaurants, businesses, and nonprofits to collect used and littered plastic-based items and turn them into a work of art in order to raise awareness and foster meaningful dialogue around the global-scale issues of single-use plastic waste and plastic pollution. The Straw Forward art installation is made from yarn made from saved plastic bottles, plastic barrels, a pool solar cover, pool noodles, Styrofoam, over 25,000 plastic straws, plastic bags, crates, and other discarded plastic items. All items used were donated, gathered from participating collection locations, or picked up as litter. The Straw Forward art installation will be visible for public viewing at the Carnegie Science Center through February 15, 2019.